Draconid Meteor Shower May Be a Storm Saturday, But Will Anyone See? 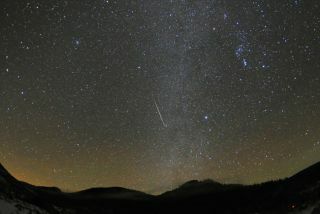 For meteor enthusiasts, the month of October usually means watching for the reliable Orionid meteors late in the month. But this year could bring a "surprise" October meteor shower: the long dormant Draconid meteor shower, will again come streaking out of the constellation Draco, the Dragon this Saturday (Oct. 8), though the nearly full moon and the shower's timing may interfere. The peak of the Draconid meteor shower promises hundreds of "shooting stars" per hour, but it will occur during the daylight hours for observers in North America, making the peak time unavailable for U.S. skywatchers. For observers outside the United States, the nearly full moon may outshine the meteor shower display. The sky map of the Draconids shows where to look to see the meteor shower this year. Spawned from Periodic Comet 21P/Giacobini-Zinner, the Draconid shower (also known as the "Giacobinids") produced two of the greatest meteor displays in the 20th century, in 1933 and 1946. Lesser showers arrived in 1926, 1952, 1985, 1998 and 2005. Comet Giacobini-Zinner travels around the Sun in a 6.6-year orbit, with its aphelion (farthest point from the sun) lying just outside Jupiter's orbit. This flags it as a member of Jupiter's family of comets; there are over 400 such comets known today. The gravitational influence of the giant planet has clearly shepherded Giacobini-Zinner into the orbit where we find it today. Periodically, the giant planet’s strong gravity continues to perturb Giacobini-Zinner a little this way or that. The meteoroids that crumble off a comet’s nucleus form a thin sheet in the comet's orbital plane. Whenever Earth plunges through this plane we have a chance for a meteor shower. Whether we get a strong Draconid meteor shower or none at all depends on exactly what part of the plane we go through and whether there is any dusty material for the Earth to interact with. Then in 1946 it was North America' turn. Unfortunately, a brilliant full moon and widespread cloud cover hindered observers in many areas but where skies were clear counts of 50 to 100 meteors per minute were reported. One report compared the Draconids to "… white snowflakes in a minor snowstorm." This map shows how to find the Draconid meteor shower during its peak on Oct. 8, 2011. Now it appears that the Earth will again pass through this very same dense dust trail from 1900 that spawned the tremendous displays in 1933 and 1946. However, unlike those previous interactions, where the Earth hit the 1900 dust trail almost head-on, calculations by a number of reputable meteor experts indicate that this time we’ll only sample the trail’s outer extremities. Nonetheless, a brief outburst of perhaps several hundred (or more) Draconid meteors per hour is anticipated on Oct. 8 by a number of reputable meteor scientists. That's the good news. The bad news is that the moon will be full on Oct. 11, which means that when the Draconids reach their peak on Oct. 8, a brilliant gibbous moon will be in the sky and likely will squelch views of all but the brightest Draconid streaks. Writes British meteor expert, Alastair McBeath in the 2011 Astronomical Calendar: "Unfortunately, the approaching full moon will make observing very difficult, but the importance of learning what happens is equally great, so watchers must simply face as much clear sky as possible away from the moon, and hope for the best!" And there's more bad news, at least for those living in North America. The pinnacle of activity for the 2011 Draconids is expected to occur sometime between roughly 4 to 4:30 p.m. EDT (2000 to 2030 GMT). Alas, that's during the afternoon hours for the U.S. and Canada. But it will be evening for much of Europe and western Asia who seem poised to have the best chance to see something. Some calculations also suggest that Earth will interact with some older comet material shed during the 19th century sometime between 1 p.m. and 4 p.m. EDT (1700 and 2000 GMT). The meteors appear to move slowly, their entry speed of 12 miles per second being among the slowest of any shower's. The radiant, or emanation point of the meteors is close to the prominent head of Draco, also known as the "Lozenge." As darkness falls on Saturday, the Lozenge will be high in the northwest part of the sky and not far from the brilliant blue-white star, Vega. Old allegorical star atlases pictured Draco breathing fire from this part of the sky. So … will the Dragon "flame" on Saturday? We'll just have to wait and see.